A couple of questions about the 90L/R and Lumenati in general. 1) I assume to make a full circle, that you want 4 90L's or 4 90R's (i.e. you want them all in the same direction). Is this correct? 2) If you make a circle, what is the inside diameter of the circle that is open, and what is the outside diameter? 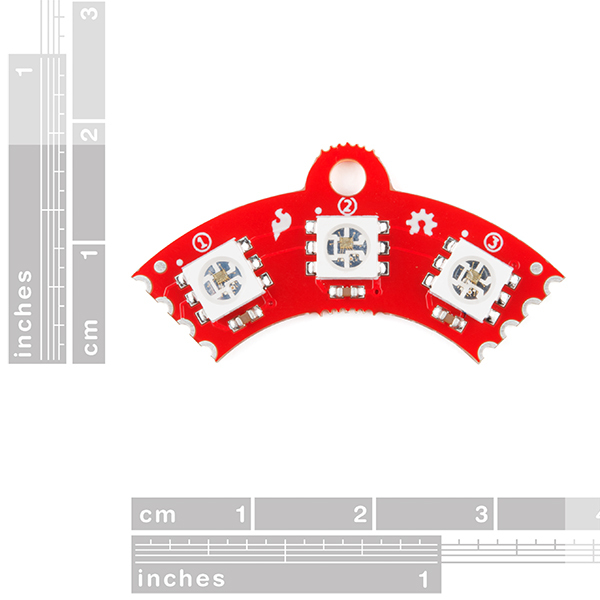 I would suspect that it is roughly the same size as the Adafruit 12 LED neopixel ring, which has an outer diameter of 36.8mm / 1.5", and an inner diameter of 23.3mm / 1", but it would be nice to be sure before ordering these. 3) In terms of sizes, would the 8-pack or the 4-pack fit inside of the ring made by 4 90L's? 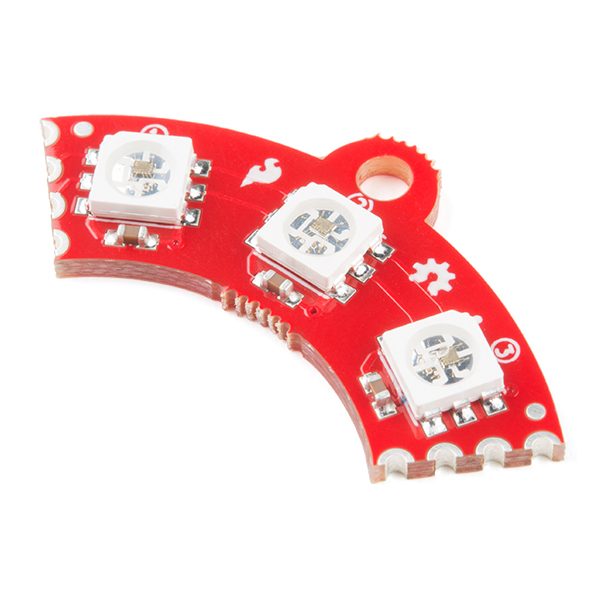 4) While 12 LED rings are useful, do you have plans for slightly larger 90L/90R variant that has 4 LEDs inside to make a 16 LED ring, which tends to be the right size for mounting on goggles. 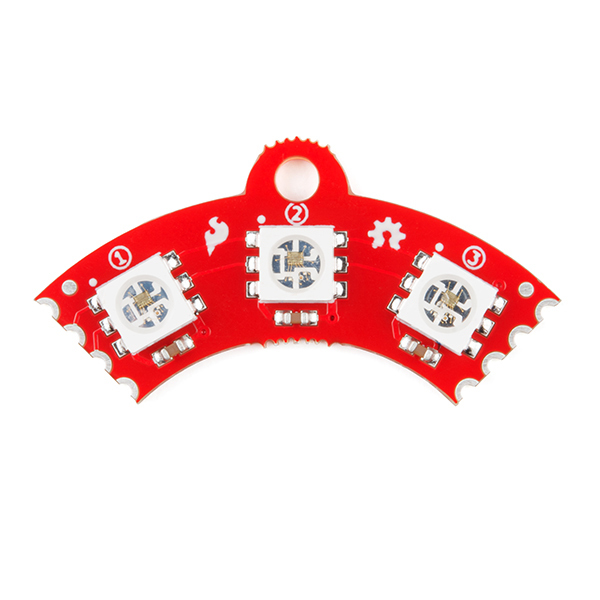 5) Some of the WS2812B/neopixel and APA102/dotstar variants have 4 LEDs inside (red, green, blue, and white). Do you have plans for RGBW leds? 6) With WS2812B/neopixels, it is often recommended that you put a beefy capacitor between ground and 5v just before the first LED to smooth over timing issues from external power supplies. Is this recommended for the Lumenati as well? 7) Similarly, another recommendation for WS2812B/neopixels is to put a resistor between the data pin and the microprocessor. 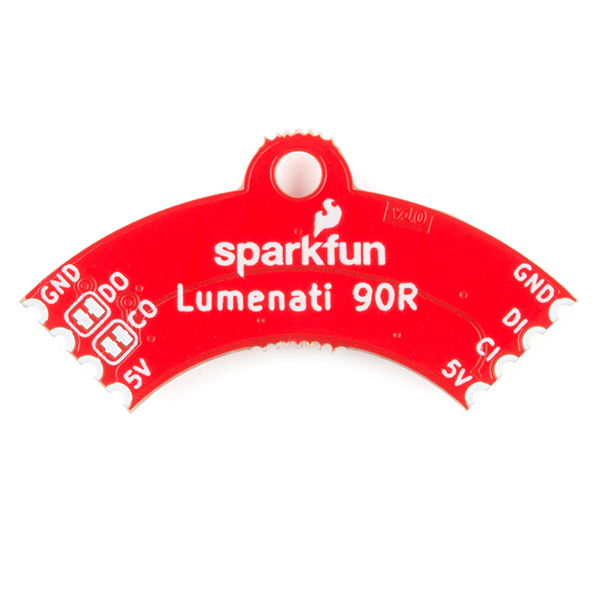 Is this needed for the clock/data pins on the Lumenati? I assume that it is less needed, since APA102's use a clock wire instead of having to have a fixed timing sequence, but it doesn't hurt to ask. 8) In your write up it says the data pins are 0-5v. I assume this means that if I'm using a 3.3v board, I have to use a level shifter. Is this correct? Or can I feed it 3.3v data/clock signals without having to use a level shifter? 9) Due to the fixed timing window of WS2812B/neopixels, it isn't useful to use them with POV (persistence-of-vision) applications, because the timing window was to slow. Can the Lumenati be used with POV assuming you have a fast enough processor? 10) The spec for WS2812B/neopixel says that it works for 3.5 - 5.5 volts, which means for a 3.3v microprocessor, I can use VIN to power the LEDS and use the data pin without having to do level shifting. If I'm running off of a single cell lipo battery with a nominal current of 3.7 volt and using a 3.3 volt processor like the Teensy, can I skip the level shfiter? 11) What is the maximum power draw for each LED if I put all 3 colors at 255? 2) inside diameter is about 30mm, outside is about 50mm. But these numbers will depend a bit on how well you can solder. 3) The 8-pack fits very nicely. In fact, if you check the hookup guide, you'll see that's exactly what we did for the example. 4) Other variants are definitely being considered, but I'm not sure that a 4-LED 90 degree piece is necessarily gonna happen. I'd probably go for something concentric to what we've already done. 6) I would consider this a case-by-case scenario. Will it hurt? Not really, no. Is it absolutely necessary? Also no. But if I were running a long string (like 50-100 or more), I might consider putting a big electrolytic at the front. And it will become more critical with longer strings. 7) Nope, don't need that. 8) Strictly speaking, you're supposed to use a level shifter. The datasheet says a 'high' must be 0.7*VDD, or 3.5V. That said, I've been running these right off of a SAMD21 Breakout for weeks without issue. YMMV. 9) I don't have direct experience here, but these are definitely fast. If your string is short (like maybe 10-20 LEDs) I'm pretty sure you could get away with it. 10) Well, the datasheet specifies 5V for power, and I try to stay close to that for best brightness. But they might run down to 4 volts. As to the shifter, see #8. 11) Per the data sheet, each LED die within an APA102c can draw up to around 25mA when fully on (so 255), which makes the total current consumption around 75mA per APA102c. So, 5V*75mA=375mW per APA102c. 2) Hmmm, at 50mm, that is a little bigger than the 16 LED neopixel ring (44.5mm), so for goggles, you probably would want to use the 90L/90R. 3) I don't recall the hookup guide being live initially, but I probably just missed it. 4) Yeah, you can do white by mixing RGB, but with the RGBW you get white a specified color temperture. One of the things I want to do is use the LED ring as a light for a camera, and it helps if the light source is a known temp, but in the grand scheme of things, I can just do color balance in post processing. 8) I know with neopixels/ws2812b, I can sometimes get it to work with 3.3v signal and 5v power (particularly with the older ones), but it is better to do the shifting if it isn't guaranteed, since you might get a new LED string that is pickier. 10) If the datasheet says 5v (and not 3.5-5.5v), then I guess I would need a boost circuit if I was using a LIPO battery (or just use a USB battery instead). 11) In terms of power draw, it is a little more than neopixels/ws2812b (16-20mA per LED, or 50-60mA for the pixel, depending on the source, and when the source was written).